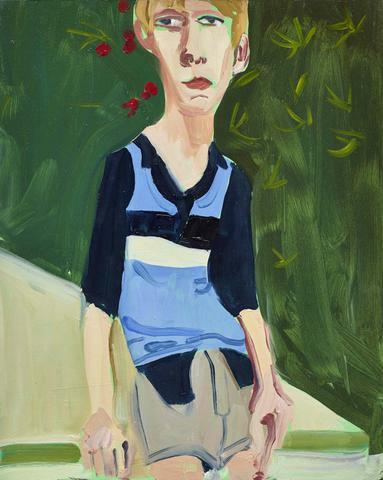 Born in 1969, Chantal Joffe lives and works in London. She holds an MA from the Royal College of Art. She was awarded the Royal Academy Woollaston Prize in 2006. Joffe has exhibited nationally and internationally at the Neuberger Museum of Art, Purchase, New York (2009); University of the Arts, London (2007), MIMA Middlesbrough Institute of Modern Art (2007), Royal Academy of Arts, London (2005), Galleri KB, Oslo (2005) and Bloomberg Space, London (2004). Joffe’s use of fashion, while loaded conceptually (i.e. 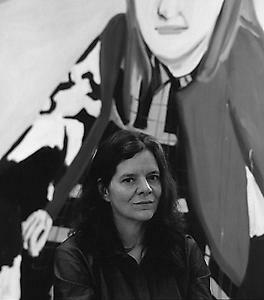 its negative associations with female objectification and the “male gaze”), derives from an honest and innocent appropriation of fantasy: Joffe chooses images that she finds most alluring, especially in terms of sparking imaginative narrative, and is driven by a love for and identification with the female form and its accessories. While the echo of feminist theory is inevitable and necessary, and perhaps enhanced by Joffe’s sometimes provocative re-appropriation of fashion photography, her work is distinctive for its unapologetic embrace and celebration of femininity. Through the ambiguity of her depictions, she rejects given definitions of womanhood, alluding instead to a long, multi-hued history of heroines, idols and icons, and to past representations of the female form. Many of her subjects are young—at the cusp of their potential—inciting further drama to their imagined narrative. But by adding her own image—less idealized and far more personal—she extends this arc further, allowing for the story to continue.